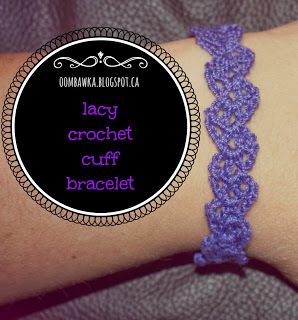 This is a very quick project and the finished bracelet is very lightweight and easy to wear – pretty and feminine – I love it – I hope you will too! 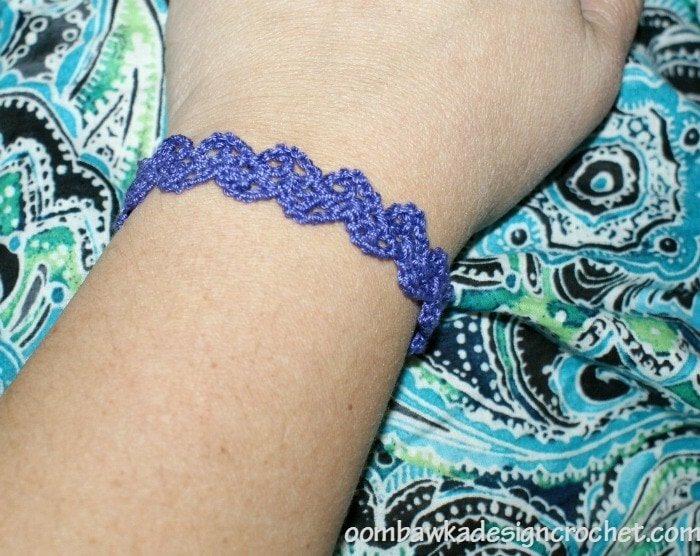 Repeat R2 until you reach the desired length – for my bracelet I crocheted 7-inches. I had a request (2015) to show the seam line where I stitched the bracelet closed. Here is a photo showing the spot where the seam is located. I have been wearing the bracelet on and off for over a year now so it is a little bit stretched (and worn!) but the seam is shown below. I whip stitched it together and then weaved in my ends. The seam is still holding strong and fairly difficult to see based on the stitch design. Thx for the free pattern! It looks nice and easy to make. Gonna make one for my girl. Thx! I forgot to tick the ‘follow-up box’ Hope to hear from you. 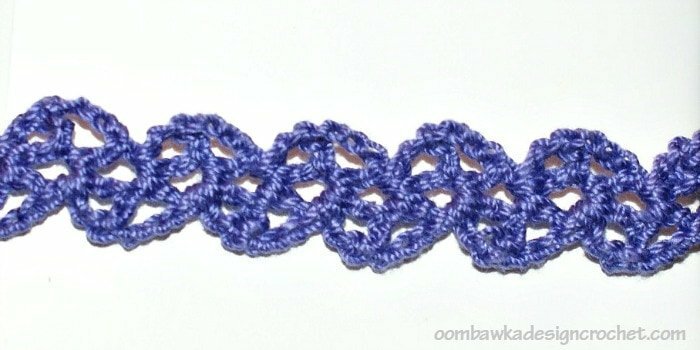 This pattern is perfect for a bookmark. 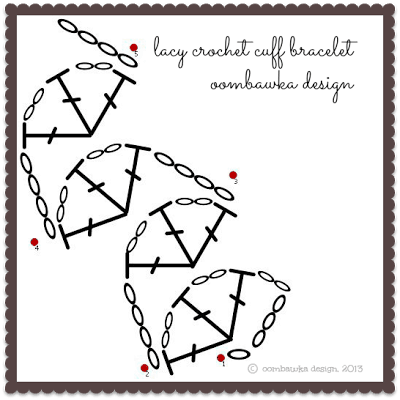 I am always looking for something different and felt very pleased when I saw this bracelet. Thank you very much. oooooooooooooooooooooooowww….I am crocheting this for meeee!!!!! Could you please show a picture of the ends of the bracelet. I have made several and have always been unable to satisfactorily connect the two ends. I must be doing something wrong. Thank you. It is so pretty. Thanks Gem! I’m so happy to hear the instructions were easy to follow!! I never thought of attaching an embellishment to it – my daughter would probably love that too! Love this pattern. I crocheted it for my daughter, and it looks fab with a flower attached to. 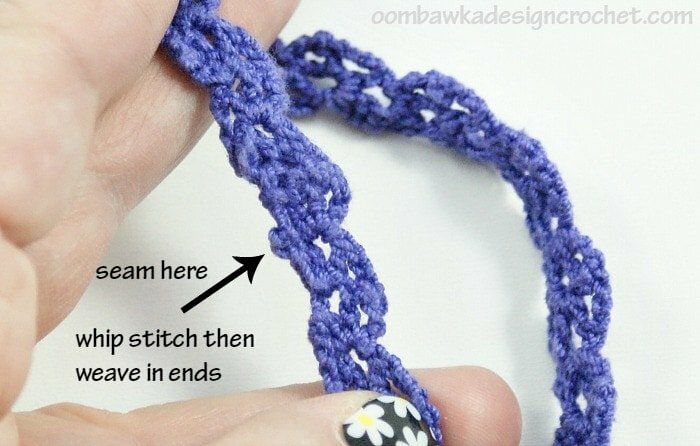 Really quick to crochet up and instructions made it simple. Thanks. I love how simple and quickly this works up! It’s so cute and pretty! Let me know if you have any questions – and feel free to share a picture of your finished bracelet! I would love to see it! This makes a beautiful bracelet. Now it’s time to make one for me. Thanks so much! This would be a beautiful headband! Thank you for the pattern!